I want Friday’s to bring awareness to other organizations that are doing wonderful things for animals. I also want to empower people. The best way to do that, give people options so they can make a difference. All of my posts give you options to help. If you have information you want to share, send me a paragraph on the topic with a link to the website, by 11am on Thursday. I will do this each Friday. Please pass this link on to bring awareness to these wonderful organizations, thanks! At the end of this post is a wonderful, entertaining, loving, inspiring video from National Geographic. 1. You’ve adopted animals but have you ever been adopted by an animal? 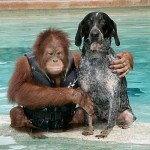 Here is a website where you can read stories about animals that have a happy ending. Join the Story Club. It is totally free and safe. Just by joining you will be helping to save lives and ease the suffering of unfortunate animals. Floyd the Dog writes, and encourages others to write, stories about animals and their interaction with each other and with humans. His concern and compassion for animals is the basis for the free website publication of these stories both here and on his Story Club. Daphne adopted me. She hates the cold and was flying from the north of England, where she says she was born, to her winter home in the much kinder climate of southern Spain. Click here read more about my adopter. 2. With the seasonal closing of the Melbourne track in Florida, it is wonderful how various Greyhound organizations have supported one another to ensure good homes for the Greyhounds. While Gold Coast Greyhound Adoptions has already fostered a handful from Melbourne already, they need additional foster homes. 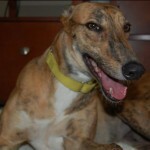 Gold Coast Greyhound Adoptions is greyt to work with, as they pay for all expenses related to the care of the fostered Greyhound. It includes food, medical, crate, etc. All you do is supply the love. It takes anywhere from 2 days to several weeks to find a home for a Greyhound. 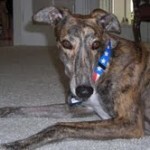 You are not expected to adopt the fostered Greyhound, either. Update—April 14, 2010: Congratulations, New Hampshire advocates! At around noon today, the New Hampshire Senate overwhelmingly voted to end greyhound racing in the state forever. We expect that the governor will sign the bill into law. Click Here To Keep It Enforced and get the bill passed in your state! 3. This was sent to me by, Jacob Versnel, one of my contacts in the Netherlands. It’s a hard story to read but they are working towards a happy ending. You can help. No rest. No water. No care… He traveled more than 1,000 miles to his death. Bred only for food, he spent his life unloved and unnamed. His final indignity was the tortuous journey from Romania to Italy to his slaughter. 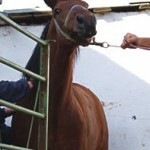 Every year over 50,000 horses are transported from Eastern Europe to Italy for slaughter. Compassion has investigated the long distance transport of horses across Europe – we were shocked by what we found. Just imagine being pushed and pulled into a truck, standing for hours on end, without water or a chance to rest. It is proven that horse welfare deteriorated after 8-12 hours of transport. Yet our investigators found that the truck filled with horses that they followed, traveled for over 24 hours. What a sad reflection on modern Europe that this cruel practice is still allowed to continue. But you can help. The final journey – When our investigators followed a truck transporting horses from Romania to Italy, they found the drivers broke an important EU regulation by not providing these animals with water. They also broke with basic human decency, in their cruel disregard for animal welfare. If, like us, you believe that no farm animal should be transported for more than 8 hours, please support our work to end live transport and factory farming. We want to stop to this heart-breaking disregard for animal welfare. Through investigations, lobbying and vigorous campaigning, we’re working to limit transports of farmed animals to 8 hours and ultimately to stop the long distance trade in live animals. At the very least, we want to see the existing welfare laws properly enforced. YOU CAN MAKE A DIFFERENCE BY CLICKING HERE. 4. The eye of the Tiger. Have you ever heard of Tony The Tiger? He does exist. Tony the Truck Stop Tiger is a 9 y/o Siberian/Bengal tiger who has lived his whole life at a truck stop in Grosse Tete Louisiana. His home is one of concrete and steel. In Dec 2009 the Louisiana Dept of Wildlife and Fisheries granted a permit to Tony’s owner to keep him at the Truck Stop. This permit is valid for 1 year. Tony’s living conditions are abhorrent. He is not living the life of a Tiger. 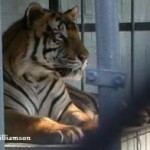 He urgently needs to be rescued and allowed to live out his life in a sanctuary. Big Cat Rescue will take him in. Tony needs heros, click here to help. The people who have Tony say that they have had him since he was a baby and he’d be traumatized if he were sent to live someplace else. They also say the Big Cat Rescue would not love, and care for him, the way they do. They say they are providing him a good home. The owner, Michael Sandlin, says: “People from out of state are telling the most outrageous lies and half truths about Louisiana’s Tiger Truck Stop. When they came to the Parish Council Meeting to argue against my rights, they resorted to yelling and name calling, finally stooping so low as to demean me and my family by labeling us as “inbreds”. Classy talk from supposedly sophisticated activists.” Michael’s family and friends extended every courtesy to those people and were repaid with ugly slurs and hate speech. Please let us know your thoughts and ideas to resolve a situation like this. There are a lot of issues like this in the US and around the world. 5. They lay on an ice pan, just a few feet apart — two seal pups sleeping quietly, blissfully unaware that a sealing vessel was bearing down on them, just 100 meters away. As painful as it is to bear witness to this horror, the people with HSUS know they have to keep going there — because every picture, video, and word that they send out to the world touches the hearts and minds of people and governments. That’s why the sealing industry doesn’t want them there. And that’s why they need your help. Give now and your donation will be tripled by the Giant Steps Foundation and other generous donors. Watch this video of the beautiful harp seal nursery to see what your donations and support are working to protect. 6. “The Cove”, a documentary and winner of audience awards across the world, including Sundance, SilverDocs and Hot Docs. The Cove follows a team of activists and filmmakers as they infiltrate a heavily-guarded cove in Taiji, Japan. In this remote village they witness and document activities deliberately being hidden from the public: More than 20,000 dolphins and porpoises are being slaughtered each year and their meat, containing toxic levels of mercury, is being sold as food in Japan, often times labeled as whale meat. Under the direction of the film’s Ric O’Barry, Save Japan Dolphins.org/Earth Island Institute is actively working in Japan to shut down this brutal practice. There are ways you can help make a difference. You can donate here or you can send letters, emails, sign petitions or help in other ways. Learn about other options here. 7. What will happen to the rescued animals that Martina Navratilova has at the sanctuary she owns, but is selling? Martina and her partner were very much in love when they paid more than $1 million for land where they could rescue 26 malnourished cows likely to be made into dog food. They bought the land through their new company, MT Nest. M stood for tennis legend Martina Navratilova; T was her partner, Toni Layton. The couple turned the 20-acre site in East Sarasota County into a sanctuary where about 100 cows, horses, pigs and other animals, many saved from slaughter, could live in peace. But in 2008, the couple split and Navratilova threw Layton out of her luxury home on Casey Key, a claim by Layton based on lawsuit records. Now Layton and other local animal lovers say Navratilova plans to sell the sanctuary and the animals with it. Animal activists who placed animals there are worried they will now be sold to farmers and slaughtered for meat. Read the whole story here. 8. Watch this video that was on National Geographic. 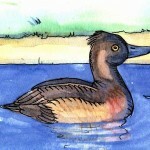 It is funny, heartwarming, educational and something that will make you feel good all over. My first love, & one I hope to never be apart from, is & always has been animals. Thanks Donna, I enjoyed watching the clip. I had a cat adopt me long ago…LOL…and 8 years ago a beautiful Akita mix made my home his….Not sure it that’s your version of an animal adopting a human, but it sure is mine. The cat just showed up and the dog, well, let’s just say he knew we needed him more than he needed us! I love what you are doing…I look forward to more Animal Connection! great post. I look forward to seeing the show. Very creative way for us to see the problems yet give us ways to help from home. I hope all of the dogs get adopted or fostered. Wish I lived closer. I’d take one. I hope they shut down all of the tracks like they did in New Hampshire. What a great video. Made my night. This was great. I loved the videos. You made it easy for me to make a difference with the links you posted. You are making a huge impact in our world. You are a very special person. Jake, I agree. I love to get her posts. I learn so much and feel I am somehow making a difference. I feel so helpless most of the time. I live in Brazil and there are many animal issues here. Like she says, we are all connected.